Atlanta Motor Speedway is launching another "Fans First" initiative promising to enhance guest experience when NASCAR returns for its annual stop in Georgia next year. The initiative, dubbed "20 in 20", will see 20 individual improvements to Georgia's NASCAR weekend in 2020; each enhancement will be made to increase fan value and overall enjoyment of the Speedway's NASCAR events. "To me and our entire team here at Atlanta Motor Speedway the fans are our top priority," said Executive Vice President and General Manager Brandon Hutchison. "Their support enables us to have a fantastic weekend of racing each year, so we aim to make their experience the best it can be every year. "With our '20 in 20' initiative, our focus has been to do more than ever to make that happen. We have a lot of fun and exciting fan initiatives in store and we're looking forward to sharing them." Each of the "20 in 20" improvements will be revealed between now and the 2020 NASCAR weekend. The first big step in our "20 in 20" initiative was announced Tuesday. 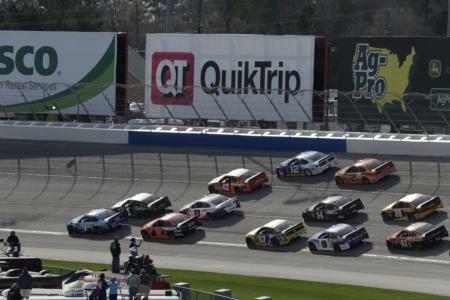 Atlanta Motor Speedway's race date has moved out of winter and the month of February to a Spring date of March 15, 2020. "The date change is something our fans have been asking for and we're thrilled to be able to answer," Hutchison said.